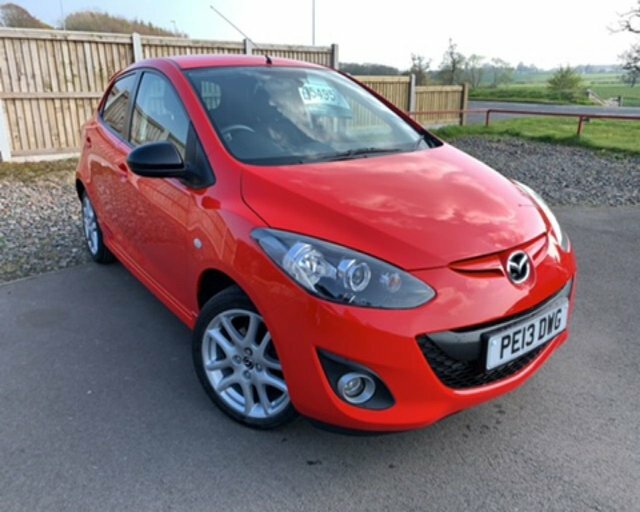 HERE WE HAVE FOR SALE A MAZDA 2 VENTURE EDITION 1.3 5-DOOR 85 BHP, FINISHED IN RED WHICH IS COMPLIMENTED BY A BLACK PATTERNED CLOTH UPHOLSTERY. THERE HAVE BEEN THREE REGISTERED KEEPERS FROM NEW & IT COMES COMPLETE WITH A FULL SERVICE HISTORY UP TO 02/04/2018 @ 42168 MILES. THERE ARE 4 STAMPS ( THE FIRST ONE WAS CARRIED OUT BY MAZDA MAIN DEALER & THE REST WERE DONE BY LOCAL NON FRANCHISE GARAGE ). DUE TO THE EXTREMELY LOW CO2 EMISSIONS, THE ROAD TAX IS ONLY £30 PER YEAR !!! STANDARD SPECIFICATION INCLUDES COLOUR SATELLITE NAVIGATION, 16 INCH 5 DOUBLE-SPOKE ALLOY WHEELS, AIR CONDITIONING, AUX PORT, REAR PARKING SENSORS, ELECTRIC WINDOWS, ELECTRIC FOLDING MIRRORS & IT HAS TWO SETS OF REMOTE KEY FOBS. Attractive exterior styling and interior design help to make the Mazda2 one of the leading options in the crowded supermini segment. The car's sporty looks are combined with a spacious interior that's well thought out and flexible enough for everyday life. Better still, the model provides plenty of fun behind the wheel thanks to a range of punchy engines and sharp handling. Come and find out more about the complete lineup of used Mazda2 models for sale in Carlisle now at Intercars Of Carlisle Ltd by paying a visit to our showroom in person. You can also take a closer look at all of our used cars here on the website, and contact a member of the team for more information. Finance is available to UK residents aged 18 years or older, subject to status. Terms & Conditions apply. Indemnities may be required. Other finance offers may be available but cannot be used in conjunction with this offer. We work with a number of carefully selected credit providers who may be able to offer you finance for your purchase, commission may be received. We are only able to offer finance products from these providers. Postal Address: Intercars Of Carlisle Ltd, Carleton, London Road, Carlisle, Cumbria CA4 0AA. Find contact details here.